This album took so-called rap/rock sound to another level. 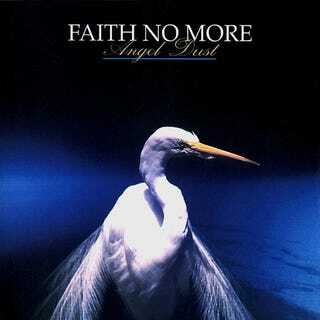 Yet despite this label that is really a misnomer, Faith No More’s Angel Dust (1992) created a master work of many genres which other bands have tried to call their own. I’m looking at you Arcade Fire and Linkin Park. As a genre, Rap/Rock was started not by Aerosmith and Run DMC, but producer and record label owner Rick Rubin. It was his idea to introduce the rap element to the song Walk This Way since the song begins with a hip-hop type of drum beat, and the tune became a hit. One can argue that Faith No More took this as spring board to their sound, but you would be wrong. FNM’s music goes beyond this simple blend. An experiment that began with the album We Care A Lot and with the following albums went into many other genres, sound effects, and noises. Angel Dust was culmination of all this, going beyond what is found in their previous work in The Real Thing. The songs do not only express the aforementioned rap/rock sub-genre, but incorporate prog rock, heavy metal, jazz piano, funk, disco and industrial rock elements into complex arrangements. Songs take unexpected turns that, for any other artist, attempting this would have been a giant fail, but these musicians perfected something special. And this sentence bares repeating: Many other bands after have duplicated Faith No More’s sound. For the uninitiated, angel dust is a nickname for the drug Phencyclidine, also known as PCP. Now then, let’s get to the music. Does emotional music have quite an effect on you? Do you feel sometimes like age is against you? I, I can help - I can help you - I can help you help yourself! Does life seem worthwhile to you? HERE’S HOW TO ORDER! Track 2 - Caffeine - Singer Mike Patton was part of a sleep deprivation and wrote the lyrics based on his experience. The incoherent placement of lyrics depicts a sense of imbalance stemming from lack of sleep. Track 3 - MidLife Crisis - Starts with an industrial rock/mechanical drum rhythm by Mike Bordin, the bass guitar is introduced as a kind of percussion instrument. The lyrics are literal. Also meant as an observation on Madonna - yes, that Madonna. Track 4 - RV - is an easy listening/saloon music number about a guy who regrets how his life turned out and curses his kid’s life for it. Track 5 - Smaller and Smaller - There is an Indian chant interlude and based on that the song is about the conditions at Reservations across the country and how the Indian (as a people) has been left behind. Track 6 - Everything’s Ruined - It starts with a tic-toc piano sound and kicks into a rock drum beat, a funk bass, prog rock guitar and classical string arrangement as performed in 70s disco music. I tell you this album has it all. Give it a listen, won’t you? <- This picture, which comes from the CD booklet, led many to falsely believe the song was about the Soviet economy when in truth, its about the effect Henry Rollins describes as The America. Track 7 - Malpractice - As fans of the bans Godflesh, this song is an assault. And the lyrics reflect the title. Track 8 - Kindergarten - A wish for the simplicity of youth. Track 10 - A Small Victory - According to singer Patton, his father always pushed him to win-win-win. A song with DJ samplings and prog rock delivery of disappointment. Can you afford that luxury? Track 12 - Jizzlobber - By far the most heavy song on the album, this is an expression of fear for the penal system and what happens to those who walk into such a place with no protection. Track 13 - Midnight Cowboy - A cover to John Barry’s theme for the film Midnight Cowboy. Very faithful (no pun intended) in its rendition until power chord guitar strums break in along with a thumping bass and pounding drums. This is one of those albums that I listened to until the cassette wore out or was damaged and I had to buy another. The first time I saw them play live, FNM opened up for Metallica on the Damaged Justice tour. The were still supporting The Real Thing record, but it seemed like everyone in that audience hated them, booing and yelling obscenities at them. The odd thing was that with each song played, they kept winning me over. Although, I didn’t cheer for them at that concert I made up my mind to check out this band. And I have been a fan since that fateful night. Angel Dust also marks a momentous occasion for the band in that guitarist Jim Martin left after the Angel Dust tour; the demon Creative Differences positioned him against the rest of the band. The most common story was that Martin wanted the record to have a sound closer to that of their previous record, while Patton pushed for what was eventually released. The irony here is that it was Martin who brought Patton into the band. Jim Martin has accomplished the most unexpected success story one could imagine. He became one of the top 5 giant pumpkin growers. There is an unedited interview with FNM conducted by MTV during the recording of Angel Dust where Martin clearly expresses his displeasure with the band’s musical direction. It clocks in at just under 4 hours, but well worth it. Question of the week (with a recommendation): Have you ever blown up a teddy bear? A cherry bomb works beautifully.